I am terrified to get big. It disturbs me how some clothes cannot fit and do not look good on me anymore. I was very emotional when I tried on clothes at the mall and nothing looks good. Jed knows this very well. And I even blamed his eating style as it is not helping me lose weight. I am very sensitive when all people could say to me was that I gained weight. Don't you think I already know that? You do not need to rub it in. A manghihilot even predicted that I am on the road to fatness. According to her, that is why my body is telling her. Excuse me!?! I refuse to receive such claim. I looked longingly at this lady at the resort's health club last weekend. She was running on the treadmill then lifted weights after. And there I was with Javi in my arms waiting for Jed to finish with his haircut. Last Friday, I visited my old gym, Fitness First Platinum in RCBC. I really wanted to cry. I saw my Body Combat instructor and I just want to hide at the women's locker as I am sure he has never seen me this big. There was this Marie France billboard on EDSA of Dawn Zulueta saying she already lost 20 pounds. I texted Jed and told him that if we ever won the lottery (Ha! We don't play the lotto. ), I would enroll in Marie France. I could not give up on food. I love to eat. And that was why I was killing myself at the gym before because I could not diet and give up certain food group. But how I can go to the gym with a baby with me? I do not want to get a yaya just to be able to go to the gym. If only we lived in Manila then my mother could easily look after him. Last night, my dearest friend Samantha gave me hope. She said the answer to my problem is a Wii Fit. That is probably the best advice I have heard. I am instantly sold. I already told Jed about it and we would save to buy it. I am already excited. I can't wait to work out again. I will make time when Javi is sleeping or he would just have to be entertained while I do my moves. Bulacan would be our home for the next three weeks while Jed is away. I couldn't believe that I'm actually missing our place in Cebu. And of course, my husband. The flight to Manila was not dreadful. Javi was an angel. He slept through most of the flight but when he was awake he was exchanging smiles and coos with our Korean girl seatmate. I had no problem using the wash room twice. I am loving the wash room for disabled as it can fit a stroller and I can do whatever peacefully. I am praying that the same thing would happen on our way back. Javi waiting at the departure area for boarding time. Days One and Two went well. I am gradually crossing off my Manila checklist one by one. Posting the list actually worked as friends are helping me by choosing an activity from the list. I wanted our schedule to be more relaxed than our previous trip. We were set to head back to Bulacan by 5:30pm. Then the most unfortunate thing happened. Traffic in EDSA held us up and we reached Bulacan three hours after. My dearest son managed to do everything in the span of three hours - cry, sleep, wake up, feed, peed, pooped, changed diaper, sleep again. I was changing his diaper while we were stuck in Meralco Avenue. I couldn't wait until the nearest gas station as he wouldn't stop crying. And who knows what time we'll reach the closest one. 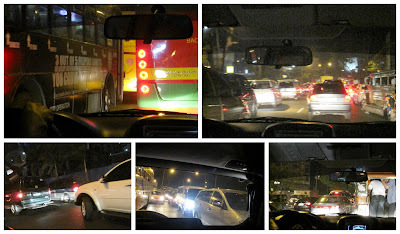 Manila is a nightmare when it comes to traffic. Makes me miss good ol' Cebu. "Reflect on the 21 days of The Gratitude Challenge and what this process has meant to you." I never thought I'd reach this day. Yes, I finished The Gratitude Challenge. All it took me was commitment. As I said in the beginning, I wanted more meaning in my life other than being a stay-at-home-wife and mother. It's also a way to force me to blog. I needed to be more positive. I want to appreciate life more. I wanted to veer away from all the hatred and resentment of life. I needed something like The Gratitude Challenge. I began to appreciate the simplicity of my life now. I surprisingly discovered that I fell in love with Cebu. I now HEART Cebu. I love the people around me more. I sent out postcards and letters for the very first time from here. I found the post office. Sort of. I saw beyond my son's crying fits. He's a happier baby now. I implemented a "Me" time where I take time to do things that I want. I am now more generous with my "Thank you's." I am slowly accepting and understanding the demands of my husband's job. I am now more open to discovering new things & places and trying out new stuff. I thank God as often as possible for the life I'm living now. A big thanks to my two wonderful friends - Malou and Sam - for getting me hooked on this challenge. It definitely doesn't end here. I will keep on working on improving myself and my life. We will be in Manila for three weeks. 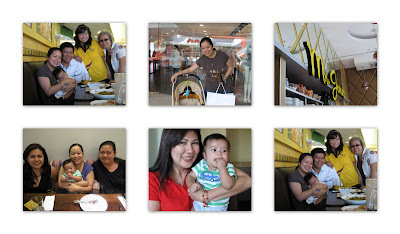 We are staying in Bulacan though so planning meet-ups in Manila would be kind of challenging. Lesson learned again, I no longer want to tire Javi the way I did the last time. Poor baby. And poor mommy. I do not have a schedule yet. I will probably play it by ear. Some of my dear friends do not even know we will be in Manila. Please do not get hurt. I am still trying to find ways to see friends and relatives which wouldn't leave the two of us exhausted. That's my lucky 13. Can't think of anything anymore. I am sleepy. It's midnight. This is a running list anyway. So I can add or delete as I wish. "As The Challenge winds down, write a thank you note to yourself. Thank yourself for taking the time to stop and focus on all little things for which you feel grateful." I only have one more day left. I cannot believe I am about to finish The Gratitude Challenge. It was an enjoyable journey for me. There's a saying that it only takes 21 days to make a habit. I would want to continue living life with a more appreciative and grateful heart. Jed is off for another business trip. No, make that that trips as he is flying to two countries one after the other. He will be away for a total of three (long) weeks. Javi and I have no choice but to travel to Manila. We wouldn't want to be alone here in Cebu. That would be sad. Security wise, it seems safer to be in Bulacan with my family. While the thought of going to Manila used to give me this thrill and excitement to see friends and relatives, to dine at my favorite restaurants and to go around the different malls to check out the merchandise, that has changed when Javi came into our lives. After last month's trip alone with Javi, I dread riding the plane again. He was an angel on the way to Manila. But on the way back here, he woke up mid-flight and decided to be fussy and he ended up crying. Traveling with an infant is difficult. No wonder airlines charge very minimal out of pity to those traveling with the baby. I have so many lessons learned from our last trip which would help make this upcoming trip less stressful. We will not be checking in luggage. I checked the courier rates and compared it with extra ticket price and excess baggage costs. I made some computations and, believe it or not, it would be more cost effective to send our personal effects thru the courier. And it would be easier for me as I need not wait for our luggage anymore. What prompted this decision was the fact that there are no porter assistance in the baggage claim area of NAIA Terminal 3. We could breeze out of the airport less harassed. I packed our things earlier for delivery to LBC tomorrow. I want our stuff to arrive the same day as our flight. I weighed all three bags and it's about 20 kilos. I also bought this clear plastic envelope to put the airport essentials such as the e-ticket, ID, Javi's birth certificate and cash. This would make my life easier as there's no need to open the big diaper bag. Remember that I would be juggling Javi, the diaper bag, and the stroller alone. So all those time savers are most welcome. I keep on praying that Javi would behave on both flights. Otherwise, our co-passengers on the plane would have to endure listening to my baby cry. I hope that what people say is true, that when the baby is cute, then the crying is forgivable. I am a mom. I would definitely assume that Javi is cute and more. "Have confidence in all the choices you have made today and be grateful for being able to believe in yourself." I won't be talking about the choices I made today but about the decisions I have made in my life so far. Motherhood has suddenly made me unafraid. I have this new-found energy to do and be so much more. I chose to remain at home and manage our household. And more than anything in this world, I want to be the one to take care of my little boy. I simply couldn't bear to see another person holding him; taking care of him. Those smiles and hugs are meant for me. Though I struggle, I make sure to be in touch with my girlfriends. I am grateful for Facebook, Twitter and their blogs as they made it easier to connect with family and friends. I am determined to blog as regularly as I could. I keep this and Javi's Tumblr site fairly updated. I want to document and share his milestones using web channels. 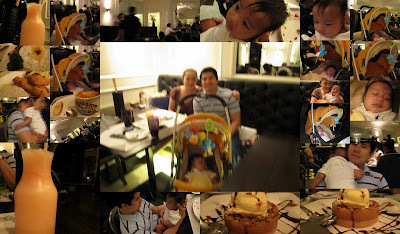 It is easy for me to update my family in Bulacan on Javi's daily activities. I have started coordinating the Philippine visit of a Canadian organization. I am believing that this is the beginning of more opportunities to work from home. My best friend helped me in coming up with my own name card. It feels strange meeting with business associates and not being able to hand them a piece of card with my contact details I want to appear somewhat "professional." We both decided to not put a "title." The possibilities are endless for now. I am wiling to take on any job that interests me. There are mothers out there whose social life ceased to exist once they have a child. I refuse to be on that same boat. Javi does not keep me from meeting my friends. If I have to bring him with me, I would. I rarely say no to invitations. There's this voice in my head encouraging me to go ahead. Javi and I are traveling again to Manila. As this is our 3rd trip, I'd like to believe that I am a smarter traveler - that I will get used to traveling with an infant and it will get easier. I get all my strength, not from the vitamins I take, but from the Lord. I am more confident now because of Him. "For the past three days, you have focused on appreciating what makes you unique. Write about all the things that make you so lovable. Take a moment to appreciate your personal style, talents and charm." Now how I can write this one when I am very very sleepy. The only thing that I can focus on right now is the bed. It is easier to write about someone else than one's self. You want to avoid sounding conceited. Now what makes me lovable? I make time to see people I love. I am punctual. I do not like being late. I can sometimes be witty and funny. I remember information and details about those I love. I have a knack at organization. We got home from our road trip on Valentine's day. We were too exhausted to go out and celebrate. We, instead, went out for a post-Valentine's day celebration on the evening of the 15th. Of course, Javi had to tag along. We went to Rica's. It's a small dining place in Cebu and they serve really good food. The place is really chic. I call it Cebu's Chelsea minus the yummy cakes. It was Jed's first time in Rica's, and he agreed with me that food is good. Prices are a bit on the higher end here in Cebu. I love dinner dates with Jed. It is challenging as we take turns taking care of Javi. But we make it happen. "Write about something you feel grateful for in your life today." Ever had one of those days when you felt like you wanted to take a break from adulthood? Back when I didn't have to worry about a single thing. How I wish that today I'd be a little girl tagging along with my Tatay. My father passed away ten years ago. But I just have this longing for him today. And I want to honor his being a father to me. I am so grateful with the life he gave me. For raising me the way he and my mother did. For being the best father. For being a very good provider who did not spoil me and my siblings. He kept us grounded. We all turned out well. He wasn't the vocal nor touchy kind of father. I never heard him say he loved me. We did not hug. That was the way he was. And even if those were missing, I felt very secure. What he lacked in that area, he made up in the rest. He was always present in my life. There were times when I wished that his attention wasn't on me. He was the disciplinarian that I needed. I would not forget the time he comforted me during my surprise 18th birthday party. I threw a tantrum then because I so did not want a party and my mother went ahead with it. I wouldn't come out of our house. He spoke to me and because I loved him so much I showed up at the party. Back then, he was the most important person in my life. It dawned on me that what I felt towards him is what fear of the Lord is. I loved him so much that I didn't want to do anything bad to hurt him. I fear him in the most loving way. Whenever I hear Luther Vandross' song, Dance With My Father, I remember my Tatay very fondly. How I wish he'd see how my life turned out after he left us. How I'd love for him to meet Jed and introduce him to his first grandchild. But I know that wherever he is right now, he is at peace. Lose a piece of jewelry. An earring Jed gave me for my birthday two years ago. I have this history of just losing pieces of real jewelry over the years. My greatest lost would be my engagement ring which I accidentally flushed down the toilet. And I thought that after that I would have been very very careful. I said to myself that I only needed a pair of nice diamond earring that I could wear with anything. I was supposed to buy it out of my severance pay but my dearest husband got it for me instead. So imagine my dismay and disappointed when I was looking for it this morning because I want to wear it, and I couldn't find the one piece. I remembered bringing it with me during our road trip. It could've gotten lost in Badian, or Alcoy, or while I was unpacking. I honestly do not know which point I could've lost it. It would take a while for me to replace it. With all the expenses we have right now, replacing the earring is at the end of the line. I would have to wait until the end of the year to receive my dividend. Maybe then it could be replaced. I am seriously thinking of not buying anything real because I end up losing them anyway. It crossed my mind that when I do have to invest, I am now thinking of buying bags instead of jewelry. Bags, because of its size, are harder to misplace. "Stand in front of the mirror for five minutes and focus on at least five things that you love about yourself. Write them down in your journal. Remember the song Unpretty by TLC? The day I am supposed to talk about what I love about myself is the day when I feel most ""unpretty." It's been three months after giving birth, I haven't shed down the weight I gained. Someone even predicted that this is the beginning of me getting huge. I refused to believe that. But then I haven't done anything to shed those pounds. The gym is a place I long to be. Unless they will let me bring Javi, then I won't be seeing my gym for a couple of years. I also do not have much time for pampering. I really have to make an effort to be well groomed. Thank God for home service, I have someone who waxes the unwanted hair, groom my unruly eyebrows, mani/pedi and massage,. It would also be nice to update my wardrobe. But with the baby and all, I cannot afford to. I secretly wish that one day, I will fit into those clothes again. When I look in the mirror. I can't help but admire my brown eyes. I have my father's eyes. And I think Javi has my eyes, too. I never had to use whitening products to have my fair complexion. Even if I expose myself to the sun to tan, it doesn't happen. Though it is shedding a lot now, my hair is black and straight. It does not need hair rebonding or relaxing to keep it straight. My tummy is stretch mark-free. Yes, I never had them during pregnancy. I have semi-oily skin which will keep my skin young and less lines than those with dry skin. According to the song, it's not about the facial/physical features, what matters is what is inside my heart, my mind and my soul. The Gratitude Challenge (Day 15): Moi! "Take the time to focus on yourself. Appreciate and give thanks for your unique personality, skills and talents." 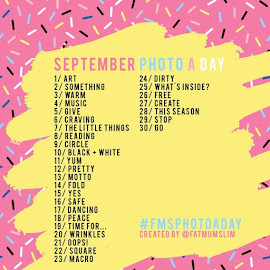 Today is all about me! Doesn't this sound a bit narcissistic? Nah! I am loyal. I will stand by the people I most love. I am obsessive compulsive. Not the disorder. This way, I make sure all tasks are finished. I am neat and organized. I really think I inherited this trait from my father. I stay true to my words/promise. When I commit to something, it'll be done. I also believe in the power of the spoken word. I am a multitasker. I have improved this skill a zillion times when I became a mother. I have a sharp memory. Jed is sometimes scared at how well I remember dates, people, etc. Well, it's failing a bit since I had that epidural. I am a superwoman wanna-be. I am a stay-at-home wife and mother. A very hands-on mom. It is the harder choice. I will make this happen. Thinking of Martha Stewart and the Proverbs 31 woman. I am a dreamer. I have so many dreams of what I want to do in my life. Dreams for Jed and me. Dreams for Javi. Dreams for our future. I believe that it starts with a dream. And a whole lot of FAITH. "It's been two weeks since you started The Gratitude Challenge. Write about how The Challenge has changed your perspective so far." Has it been two weeks already? I didn't even feel it went by that fast. Time really goes by unnoticed when one is busy. When I commit to something, I make sure I deliver. I enjoy and look forward to writing down my thoughts at the end of the day. Even if at times I do not know if what I'm typing makes sense due to severe sleepiness. Committing to The Gratitude Challenge has obliged me to see things in a different light, to see the good in every situation and be thankful. I have learned to appreciate living in Cebu more now. This is the best place for an infant. I find joy in going around with Jed and Javi looking for the best places to eat, or simply enjoying Cebu. A week ago, our laptop's motherboard crashed. It's what I use for work, blogging, social networking, keeping music, podcasts and videos for my iTunes library. Well, if the files are not in my new external hard drive then they are lost in a black hole. Surprisingly, I wasn't that upset. Yes it would take time to rebuild all my files especially my iTunes library but it'd be okay. As I try to be a superwoman, I wouldn't have the time to pause and reflect on my day. The Gratitude Challenge gave me that chance. It gave me some sort of purpose and motivation to go through each day. This is one dream performance. As in WOW!! Been a fan of the original We Are World. How I really wish I could purchase from iTunes and help Haiti in my own little way. I like celebrating this cheesy day of hearts. Nothing grand. Just do something special with my Valentino. Before we left for our road trip, Jed gave me a cupcake that came with a cute note. "Pick three friends or family members you see regularly. View their actions and gestures through a positive lens, assuming their goodness and witnessing their best intentions." He is very thorough which I need as I tend to act on impulse. He irons clothes for me. Washes the dishes when I know it's his least favorite task. He encourages me to go out and unwind while he takes care of Javi. Soon as he reach home, he would get Javi from me. He makes sure that we go out on weekends. Loves me even when I'm at my worst mood. Javi doesn't need to do anything for me to love him. I love him for the way he is. Jed finds it weird that I love the smell of his sweaty feet or hands full of his drool. I'm grateful when he cries, it shows that he needs me to hold him. I'm also grateful for the times when I'd put off house chores to talk or play with him. It shows me how important I am in his life. I'm now an early riser because of him. Boredom is something I have written off from my vocabulary. Everyday with Javi is a new adventure. I am never alone and lonely now. She never stopped being a mother. She still anticipates my needs. She lets me be a mom to Javi the way I want him to raise him. She would ask me how I want to do things, not insist on what she wants. After all, I am the mother. She would ask me how I am almost every single day. "Today, make the effort to live life with a positive outlook. Restrain from criticizing the people around you. Dare to see the glass half full. Listen more than you speak. Give freely of yourself. Practice kindness at every opportunity." Jed is on leave for a week. Hallelujah for that! As this rarely happens, we went on our first road trip with Javi and hit the beach this Valentine/Chinese New Year weekend. We were blessed with an opportunity to stay at this beautiful resort in Badian Island. It was so beautiful I seriously want to win the lotto and stay there as long as I could. My son with the welcome lei. Being in this resort, it was obviously easy for me to see the glass half full. There really was not much effort on my part to be kinder to people. It came out naturally. I just made sure I was extra nice to the very efficient. I was floored with the excellent service. It was not hard for me to express my gratitude and appreciation to the staff. necessities that sustain your current life." For today, I tried to picture or view the world through the eyes of my son. Now that I' a mother, I realized how simple a baby's life is. Javi just needs his milk, clean diaper, sleep, and lots of hug from mommy and daddy. When I give him all these, he is happy and content. I know this because Javi gives me lots of smiles - even in his sleep. That's his way of showing his gratitude to me. Javi does not hold grudges. There would be times when I'd let him cry and could not pick him up. He'd be really frantic even if I assure him that mommy's around but couldn't hold him that time. But the minute that I held him he'd be silent and I'd immediately feel how much this little boy loves me. It did not matter that I let him cry. A baby does not discriminate. My Javi would smile at everyone who smiles at him. The best thing about a baby is he doesn't worry about a thing because he trusts and totally depend on - us - his parents. We should live that way - to trust and depend in the Lord completely. "Pick one of your five senses to focus on each day. Take note of how many gifts come to you via the single port of entry. Write about this experience." Today, I chose to focus on taste. My passion is food/dining out. For late lunch, I insisted we try out 10 Dove Street in Sto. Nino Village. We had soup, salad, sandwich and a slice of cake for 185 pesos! You cannot find a better deal than this. Every dish on the photo is yummy. Now how can you not love the sense of taste?!? "Enjoy the people around you. Take a moment to appreciate their unique talents, abilities and personalities." Our laptop crashed. Motherboard problem. I am now borrowing Jed's work laptop to log in my Day 9 entry. I should be very very upset. Surprisingly I am not. Even if replacing the motherboard is equivalent to a new netbook. Of course, we would rather save the money than purchase a new netbook. My files are all lost, too. But I am really fine. I guess I'm already used to our laptop crashing, or the iTunes would reset, or my external hard drive not being read. At least Isome very important files/documents transferred in my new external hard drive. A day without a laptop means more free time. This gratitude challenge is working. I'm now looking at the glass half full. I enjoyed my day with my two boys. The three of us went to the HP store in the morning to have the laptop checked. When we found out what was wrong, we checked out prices of several netbooks. We had lunch out then ran a few errands. My little boy ended up tired and he was already sleeping in the baby sling. Jed dropped us home as he headed to the resort. Oh, Jed is on vacation leave until next week. Looking forward to spending time with him. I left my phone which can access the internet in the car. What a day, right? Javi has my full attention now. I played with him, talked to him, smiled at him, napped with him. He is just adorable. I cannot get enough of him. He is very behaved now as he would napped for a couple of hours allowing me to work around the house. This little does not even need to do anything, because I love and appreciate him just the way he is. Jed got home the usual time. We had a hearty dinner. He is such a sweetheart as he ironed my clothes for me. One advantage of a no-househelp-household is my husband ends up doing all these chores I know he would rather not do but because he loves me he does them anyway. I am very very grateful for this. A motherboard crashing is not too bad after all. The Gratitude Challenge (Day 8): Postcards! "Send thank you notes to five people who deserve a little recognition." I picked out postcards which would be my "thank you notes" for Day 8 of the Gratitude Challenge. Been meaning to send out postcards from Cebu but never had the chance to do it. I do not even know where the nearest post office is. Worse comes to worst these postcards will be sent out via courier. Haha! My heartfelt thanks to the Gratitude Challenge for "forcing" me to do this task. I easily came up with five individuals to give the cards to. Fickle-minded me thought it would be nice if I send out the cards to people abroad. So I had a revised list. Then I remembered I do not have their addresses. It would spoil the surprise if I ask for their mailing addresses now. So I stuck with my original list of five people. #1 - The only person who is consistent in sending me birthday cards, congratulatory notes, etc. Thought it would be a good to send something back and remind the person how much I appreciate the gesture. #2 - A family member who lives abroad. Another person who sends all kinds of greetings via snail mail. I wish I was that thoughtful. #3 - My soul sister. Enough said. When the person reads this, she'll know who she is. #4 - Another card will go out to person whose life has inspired me over the years. #5 - The last card will go out to a longtime friend who had been present in the different stages of my life. And we became closer because we go through each stage almost at the same time. I used to have the time to painstakingly send out Christmas cards every year. Then as the years progressed, I got incredibly busy. Let sending out holiday cards be my goal for the holiday season this year. "Take a picture of one thing, person, place or specific moment that makes you feel grateful. Share it with your social network." My Sundays are more special now that Jed and I have Javi. It's our family bonding time. We make sure that we get out of the house as Javi and I mostly stay at home during the weekday. Our typical Sunday starts with breakfast at McDonald's (or maybe Jollibee). We head to church after. Today, Javi was well-behaved. Jed didn't need to walk him around which he does when Javi gets fussy. Sunday is when I try to take a break from cooking so we dine out for lunch. We'd get dessert some other place. We would pass by a mall to run a few small errands. Not the major ones like picking out the groceries. I'd like to leave our Sunday free to do whatever we want. I took a photo of my two favorite boys during lunch. I am grateful that Jed is a doting father. When he's home he makes sure he spends time with Javi. He feeds Javi, put him to sleep or just play with him. He is the one who trims Javi's finger and toe nails. because I do a really bad job. I just love watching them together. It's a good feeling. My world revolves around these two. "Take a few minutes to call someone you haven't talked to in a while. Tell them how much you appreciate them." Let me modify the guideline a bit. Instead of a phone call, I chose to e-mail someone I have not been in touch with for a long time. I'm not a big fan of Alexander Graham Bell's discovery. 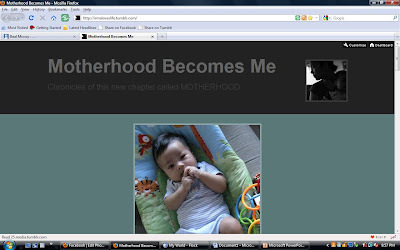 To make it more interesting, I chose someone that does not have a Facebook account nor knows the existence of this blog. It would feel more special if the person does not know I am doing this challenge. I immediately thought about my friend Susan. Susan is from the Regional Office in Singapore. 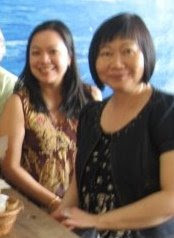 When I was still working at the embassy, she and I would be e-mailing each other almost every single day. We would meet once or twice a year for our annual meetings. Being a typical Singaporean, she is very efficient and resourceful. I learned so much from her. I admire her work ethics. I always wanted to emulate her work attitude. In the more than five years that I knew her, I somehow found out she's a Christian. She would be sending me inspiring messages. And through her, I've witnessed the goodness of God. She is very thoughtful. I remembered how the Kitchen Club (that's how we called our regional group) surprised me with some kind of bridal shower. On the group's farewell to me, she asked each colleague from their countries to bring something that would remember the person and the country. She also handed me a CD compilation of photos of the Kitchen Club over the years. During the worst time at the office, I would go to her and she would talk words of wisdom and comfort to me. And I survived that Devil Wears Prada phase. Earlier today, I sat down and took the time to e-mail Susan to tell her how much I value her. I had been meaning to write to her but couldn't find the time. The timing could not have been more perfect as she's a bit unhappy at the office. I do hope she feels better when she reads my message to her come Monday morning. "Take five minutes to write about how grateful you are for all of the wonderful things that you currently have in your life. Don't long for what you don't possess - instead, take stock of all the blessings you already enjoy." This day is a dream. It is the exact opposite of my exhausting yesterday. I am at my happy place. Household chores all done. Javi napped for a good couple of hours letting me finish what I needed to do. Dinner was prepared way ahead of time. I spent my late afternoon having a conversation with my little one. He was cooing and smiling. I really hoped I made sense to him. He's all big now. He can, more or less, support his head. The trip to the mall this morning was also a breeze. Javi was in the baby sling and he was one angelic baby. He probably was amused with what he's seeing. He even slept while I went around and ran errands. There was no crying. Thank God! Days like these make me appreciate life more. I have a wonderful husband, an adorable son, and a nice quiet place in Cebu. I am grateful for this simple life. "Write a short message of thanks for some of the "negative" things in your life." Talk about Murphy's Law, this day had been a test of patience on my part. It started as a typical day for Javi and myself. I was taking care of the little boy sneaking in household chores or surfing the Web while he was napping. So far so good. I worked on my list of chores for the day hoping that if I finished them during the day, I'd have more free time in the evening. Now this meant enduring Javi's cries when he wanted to be carried and I couldn't pick him up. I started ironing clothes while Javi sat in his infant seat sometimes smiling then crying. And then the power went off. It was almost six in the evening. Uh-oh. I couldn't do anything else. I couldn't even watch American Idol. Javi became fussy and started crying. Since I cannot do anything else, I picked him up attempting to rock him to sleep. Half hour passed. No electricity yet. Javi has not fallen asleep. He appears hungry. So I fed him. He wouldn't drink the milk instead he was smiling at me in the dark. Poor baby as he was sweating because of the heat. An hour passed and the light on the candle is still burning. I missed American Idol. I couldn't cook dinner. There's a basinful of flipflops I need to clean. Let us not forget the clothes I need to press. Javi is now fussy. I've tried everything - fed him, changed his diaper and clothes, burped him, rock him to sleep, nothing works. I was getting pissed as I'd have to stay up late again to finish the house chores. Power came back after almost an hour and a half. Time for me to cook dinner. Javi wouldn't let me put him down. I tried everything again and he wouldn't stop. I ended up carrying him while cooking. Yes, I'm a superwoman who by this time is exhausted. After juggling cooking and taking care of Javi, the doorbell rang and my knight in shining armor is home! I now breathed a sigh of relief. This is how my typical day goes. It is exhausting. It is hard. But I refuse to give up. I cry once in a while to feel better. I realized how the Lord is working on me by stretching me as He knows what I am capable of. This is an opportunity to practice patience and grace. Staying at home and being a house wife and mother is the most difficult "job" I have ever had. It's a 24/7 type of job with no vacation leave and no salary. But no amount of money could compare to the fulfillment of seeing your child grow up. I will be around for his many firsts. It is a privilege that not all mothers have. Never in my wildest dream did I ever think I would end up living here in Cebu. I have been used to the fast-paced life in Manila where my world revolves around my family, friends, work, places to hang out, gym, etc. The move to Cebu had not been easy. In the first couple of weeks, I refused to leave the house, or do anything. I sulked big time. Things eventually picked up and I somehow got used to the life here. And then I got pregnant. My pregnancy hormones resented being in Cebu. I craved for food only found in Bulacan or Manila. wanted to be surrounded by friends. I ended up depressed. I finally gave birth to Javi, and the situation didn't get any better. I wanted to be closer to family and friends. I felt I did not know how to raise a newborn. I felt so alone. But this year, I'm slowly beginning to appreciate the simple life here. I finally understood why the Lord brought us here. His plans are indeed perfect. Jed, Javi and I have our own little world here. There are not many places to go to compared with Manila. But with Javi in our lives now, we really can't go to as many places as before. I appreciate how everything is 10 minutes away. We can leave the house with just one bottle of milk and a diaper and we'd be fine. The three of us would be going around Cebu on weekends trying to discover new places. Later on we can come up with our own list of favorite things to do in Cebu and places to check out. Our recent trip to Manila made me appreciate the quiet life we have here. I love the place we call home. It's not big, but the size is perfect for us. I do not need a baby monitor as I can hear Javi anywhere in the house. I can easily keep an eye on him while I'm in the kitchen and he's sleeping. Javi and I can run errands and we'd be back home in two hours max. Manila is a whole different story. It's too much for the little boy (especially for the mom!). Let's wait for him to get a bit bigger. God has put us exactly where we need to be right now. "Use the alphabet as a fun and quick format for making a list of things for which you feel grateful. Share this list with your social network through email, a blog post or a Facebook or MySpace page." B -books. beach. Brothers & Sisters. F -friends. frozen yogurt. Facebook. G -God. girlfriends. grace. Glee. J -Jesus Christ. Jed. Javier. L -love. laughter. laundry service. Q -quiet time. quality time. V -Via. Victory Christian Fellowship. vacation. W -Women's Life Group. work. A Facebook status of my dear friend Malou said that she is accepting/ready for the Gratitude Challenge. This definitely caught my eye, so I asked her what it is about. She sent me a link to the Gratitude Challenge. It is a 21-day challenge to be more positive about life. Wow, now, this is definitely what I need to focus on right now. Malou, and another friend Sam, started their Gratitude Challenge at the beginning of the year. I wanted so much to do it as the same time as theirs but I was off the internet for a week therefore I could not blog about it. I'd start my own challenge in February. If you wish to know more about how their Gratitude Challenge went, please click on their names and it will lead you to their entries about the 21-day challenge. I hope their lives would inspire you as they have been inspiring me. Today, I signed The Gratitude Pledge and I'm ready to begin the 21-day challenge. Life as a stay-at-home wife and mother had been overwhelming. I would find myself crying out of exhaustion. I definitely need this challenge to remind me why I love my life. I have to be looking at the brighter side of life. I am determined to make this a better year for me. Thus making me a better person. I created a Tumblr site to document how I approach motherhood. Javi has his own site. Please click on this link. I have not been updating as often as I wanted to. I am slowly logging in Javi's activity, antics, and milestones.